Żyrardów [ʐɨˈrarduf] ( listen) is a town and former industrial hub in central Poland with approximately 41,400 inhabitants (2006). 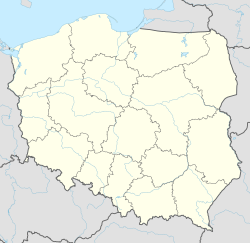 It is the capital of Żyrardów County situated in the Masovian Voivodeship (since 1999); previously, it was in Skierniewice Voivodeship (1975–1998) 45 kilometres (28 miles) west of Warsaw. Żyrardów, initially a textile settlement, was named after French engineer and inventor Philippe de Girard, who worked in the area. Founded by the Łubieński brothers as a textile factory in 1833. One of directors of the factory was French inventor Philippe de Girard (from Lourmarin). The town developed during the 19th century into a significant textile mill town in Poland. In honour of Girard, Ruda Guzowska was renamed Żyrardów, a toponym derived of the polonised spelling of Girard's name. On September 13, 1939 Germany captured the town. In 1941 they transported Jews into Warsaw ghetto. The town museum is nowadays located in the former palace of owner of factory K. Dittrich. A sign near the entrance to the town states that it was the only city in Europe, entirely set up for a factory. The town was named one of Poland's official national Historic Monuments (Pomnik historii), as designated January 17, 2012. Its listing is maintained by the National Heritage Board of Poland. Most of Żyrardów's monuments are located in the manufacturing area which dates from the 19th and early 20th centuries. It is widely believed that Żyrardów's textile settlement is the only whole urban industrial 19th-century complex to be preserved in Europe. Since 1923 in Żyrardów a football club named Żyrardowianka Żyrardów (used to be named Włókniarz Żyrardów), which in 2015/2016 was part of IV League of polish football. Henryk Łubieński, banker and industrialist, son of Felix. Wikimedia Commons has media related to Żyrardów.